According to Ceresana’s newest market report on HDPE, the third edition already, the Asia-Pacific region is by far the largest consumer of this important kind of plastic. Within the last eight years, it has increased its world market share from 33% to 44%. Also, in the future, this region will grow the strongest, however not to the same extent as in the past. Eastern Europe and the Middle East experience a constant growing demand for HDPE. Within the last years, the markets in North America and Western Europe shrank but will now grow again. In the course of the next few years, North America is expected to manage a turnaround. HDPE is most frequently used for the production of films, most of all packaging films, bags and sacks. In 2014, around 26% of the total consumption fell within the field of rigid packaging (e.g. bottles, canisters and covers). Another significant application area are products for the construction industry, such as pipes and cables. In Asia-Pacific countries, extrusion dominates as processing method, due to the high film production and the strong construction industry. However, in North America and Western Europe HDPE is mainly processed with blow molding and injection molding. Including swing plants, which can produce HDPE as well as LLDPE (linear low-density polyethylene), the global production capacity for HDPE accounted for around 57.5 million tons in 2014. For the coming years, numerous HDPE factories are planned. Although there are still a few smaller providers, already 57% of the global capacity account for the 15 largest companies (including joint ventures). This market concentration is expected to further increase over the next few years. HDPE output in Western Europe is likely to fall due to the closure of production sites and an absence of capacity increases. In all other world regions, production will presumably increase. The largest increases will be expected in Asia, the Middle East and North America. Africa and South America will have the highest growth rates, due to their low initial level. Western Europe will be increasingly dependent on imports, due to decreasing capacities. North America increases its net exports over the following eight years by presumably over one million tons. The most HDPE will be exported from the Middle East: net around 4.8 million tons a year. Chapter 1 provides a presentation and analysis of the global market for high-density polyethylene (HDPE), including forecasts up to 2022: Development of revenues, demand, production and capacities are analyzed for each individual region. Chapter 2 offers a detailed analysis of the HDPE market in the 27 major countries. 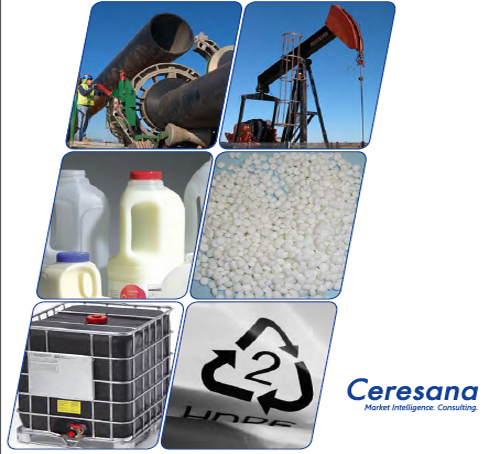 Data on demand, revenues, production, producers of HDPE and their capacities as well as import and export is provided. Additionally, a detailed analysis of the 16 major countries, with respect to application areas of HDPE, will be presented. Chapter 3 outlines a detailed examination of HDPE application areas. Data on demand development in individual applications is given for the world as a whole and split by the regions Western Europe, Eastern Europe, North America, South America, Asia-Pacific, the Middle East and Africa. The applications are split in packaging films, bags and sacks, other films, rigid packaging, construction products and other applications. Chapter 4 provides useful profiles of the largest HDPE producers – clearly arranged according to contact details, turnover, profit, product range, production sites, capacities and profile summary. Extensive profiles of 92 producers are provided, including Braskem, Chevron Phillips, China National Petroleum Corporation, ExxonMobil, INEOS, Lotte Chemical Corp., LyondellBasell, NPC, SABIC and SINOPEC.